A suite of four engravings of paesaggi italiani con figure after designs by Francesco Antonio de Capo, a painter born near Lecce in Apulia, documented in Naples and Rome from about 1775, where he associated with the Genoese landscape painter Giuseppe Bacigalupo. The printmaker Giuseppe Cunego was born in Verona in 1760, the son and pupil of Domenico (1726-1823) and brother of Luigi Cunego. He followed his father to Rome, but soon abandoned art, takings up the religious life as a lay brother of the Third Order of Minims. 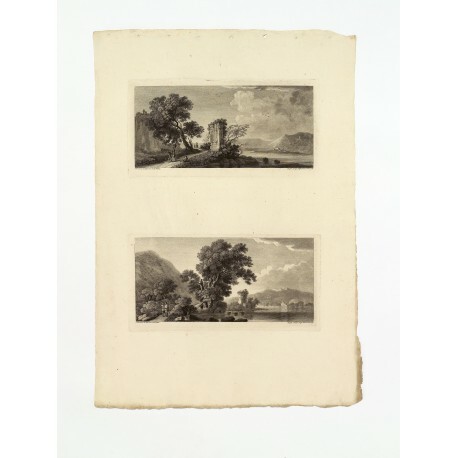 His engraved oeuvre is just fifteen prints: eleven engravings after Gaspard Dughet's frescoes in the Palazzo Colonna in Rome, dated 1781 or 1782; and these four prints, each dated 1784. Four engravings (145 × 290 mm platemarks, imposed in pairs on two untrimmed sheets measuring 565 × 400 mm), with identical legend beneath each print Franciscus de Capo inv. et del. Romae | Joseph Cunego sculp. Romae anno 1784. The untitled prints depict: (a) river landscape with five travelers on a road passing an antique tomb; (b) river landscape with two travelers on a path, a ruined tower behind; (c) river land­scape with a single traveller on a road; (d) river landscape with four travelers (one on horse­back, another in foreground seated). Superb impressions on almost untrimmed sheets. 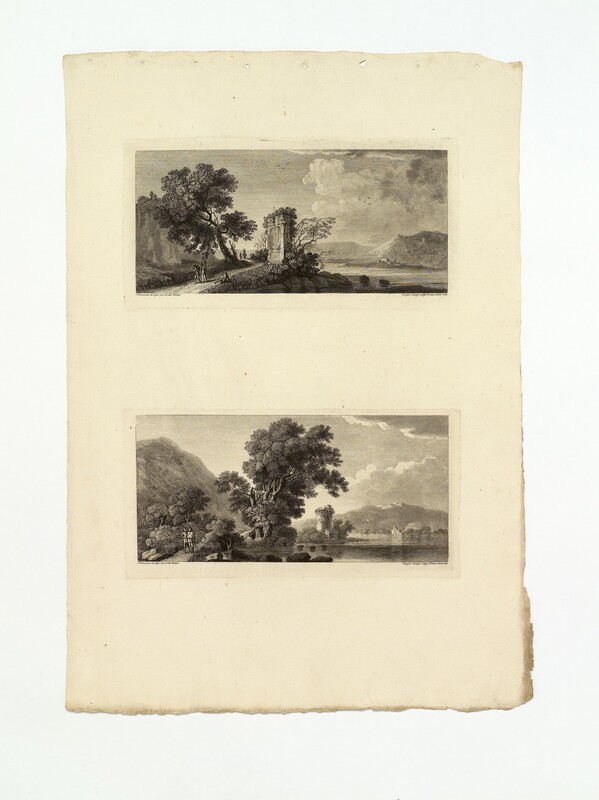 Prints (a) and (b), by Giuseppe Cunego after Francesco de Capo. Prints (c) and (d), by Giuseppe Cunego after Francesco de Capo. 1. Andrew Robison, Piranesi. Early architectural fantasies (Chicago & London 1986), pp.227–228 nos. 59, 64. 2. 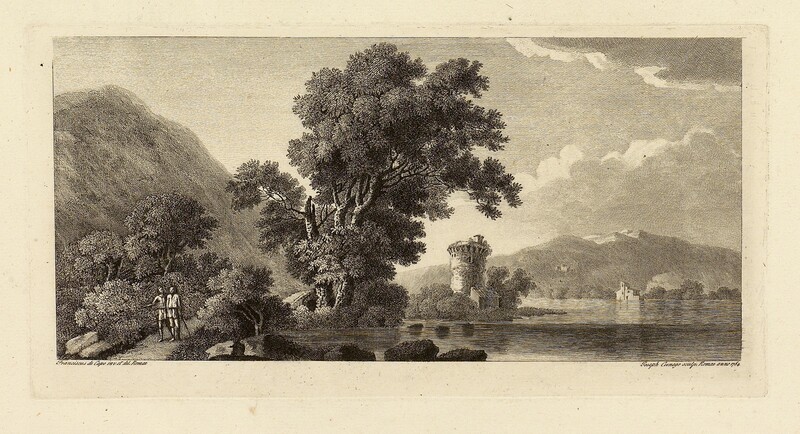 Baldassare Orsini, Guida al forestiere per l’augusta Città di Perugia (Perugia 1784), p.89, records ‘Due paesi squisita­mente acquerellati, ed inventati con gusto, e naturalezza’ and ‘Dieci pezzi dipinti a olio’. A wash drawing ‘Cascatelle di Tivoli’ with inscription on the mount ‘Francesco da Capo detto Ciccio’ is reproduced by Marco Chiarini, Vedute romane: disegni dal xvi al xviii secolo (Rome 1971), p.79 no. 101; a panorama of Rome, signed Capo fecit. Roma 1794, is reproduced by David Scrase, Italian Drawings at the Fitzwilliam Museum, Cambridge (Cambridge 2011), pp.169–170 no. 129. 3. National Gallery of Scotland, Catalogue of Italian Draw­ings, by Keith Andrews (Cambridge 1968), p.29, fig. 226a; David Laing Bequest to the Royal Scottish Academy on loan 1966, RSA 404 (collection database; link). 4. Marie-Nicole Boisclair, Gaspard Dughet 1615–1675 (Paris 1986), pp.352–353 nos. G33–43, figs. 585–591. 5. 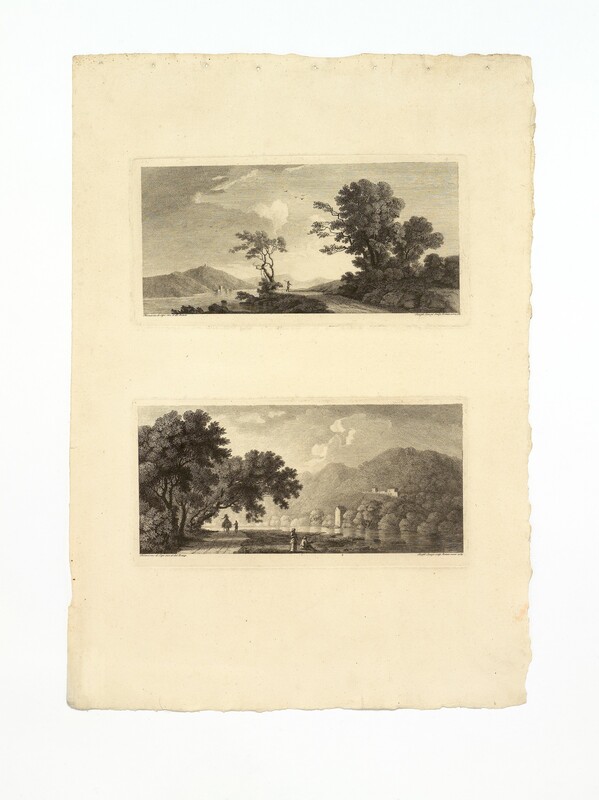 Karl Heinrich von Heinecken, Dictionnaire des artistes, dont nous avons des estampes (Leipzig 1789), iii, p.576 (‘Joseph Cunego a gravé quatre Paysages’); Charles Le Blanc, Manuel de l’amateur d’estampes (Paris 1856), ii, p.76 nos. 1–4. 6. Zeno Davoli, La Raccolta di Stampe ‘Angelo Davoli’. Catalogo generale (Reggio Emilia 1999), iii, no. 10018 (database; image).